With 2013 well underway, we continue to observe the clear signs of recovery.Â Like most transitions, this one is not without its challenges, but the upward trajectory seems clear to anyone observing facts rather than emotions.Â However, there is a lag from the time facts become available until public sentiment broadly accepts those facts.Â Remember that the next time you see an article explaining how the valleyâ€™s market is worsening or that loan defaults are on the rise.Â It simply isnâ€™t true.Â Since 2004, an ongoing challenge has been to separate market fact from fiction.Â With that in mind, we return to the subject of market statistics.Â As always, our numbers come from the incomparable Michael Orr of the Cromford Report. Supply of homes for saleÂ The supply of new resale listings coming on the market remains constrained. The total current supply of homes for sale is 8.7% lower than last year.Â The primary cause for the reduction in inventory is due to the rapidly disappearing distress product. The traditional seller is simply not coming to the market in sufficient volume to replace this loss. Â The yearly change in mix of the type of homes for sale is dramatic. Lender owned listings (REOs) are down 15.3%, but short sales show the most dramatic shift â€“ down 46.4%.Â While the traditional seller is up from a year ago with an increase of 19.1%, you can quickly see it is not enough to fill the large loss of the distressed properties. Certain areas and prices are showing a scarcity of supply more than others.Â In particular the areas that have lost inventory of homes for sale from last year and are showing the tightest supply – Â are Tempe, Glendale, Chandler, Peoria, Avondale, and Gilbert.Â Conversely, supply is still adequate in luxury home areas such as Carefree, Rio Verde, Paradise Valley and Gold Canyon. As to price ranges that are constricting, supply is very tight below $225,000.Â Between $225,000 and $500,000 supply is low but stable.Â Above $500,000, supply is recovering and in the top ranges over $2,000,000 supply is plentiful and now increasing. SalesÂ Sales remain weaker than last year, largely due to the small supply of bank owned and short sale homes available.Â Â The number of short sales and lender owned properties were both down by 47% from last year.Â Investor purchases are at the lowest number since September 2011 and now comprise only 25.3% of the sales in Maricopa County (compare that to at one point hovering in the range of 50%). Before one grabs the Kleenex box though, it would be wise to remember that while 2013 sales are down from 2012 and 2011, they are higher than any year from 2006-2010.Â So it is far from a dire situation as they remain â€œabove normalâ€.Â With pricing still below replacement cost and interest rates hovering at record low levels â€“ this market has a lot to offer buyers. 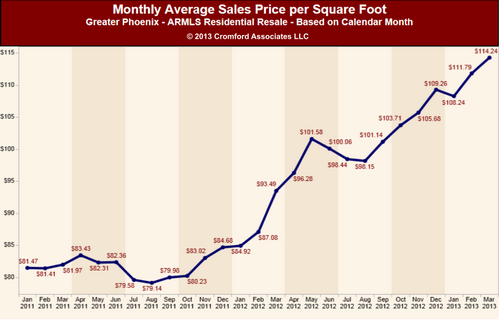 PricesÂ While price per square foot is typically our best indicator of short-term pricing trends, it is quite interesting to note long-term trends through median pricing (the point where half the sales fall above the price, half below).Â Currently our median pricing is up from a year ago by 31%.Â The median price is now $160,000 vs. $122,000 last year.Â We expect to see strong upward pressure on prices through the summer. New HomesÂ For buyers frustrated with finding a home, new homes offer only a small respite.Â While production has increased, they are not even at a third of the production levels they were at 15 years ago!Â Increasing labor costs and the time needed to put that labor team in place, combined with the fear of repeating the drubbing they took back in 2006, production remains too low to fill the demand for needed homes. As we have mentioned so many times, supply and demand ultimately provide a tug of war on prices.Â While supply continues to remain lower than demand, we expect prices to rise accordingly.Â Rising prices bring out the sidelined sellers who have been waiting to sell.Â In short, this too shall pass.Â In the meantime, we will do our best to share with you the results of this battle.Â As always, we appreciate the loyalty of our clients.Â We are here to serve you.